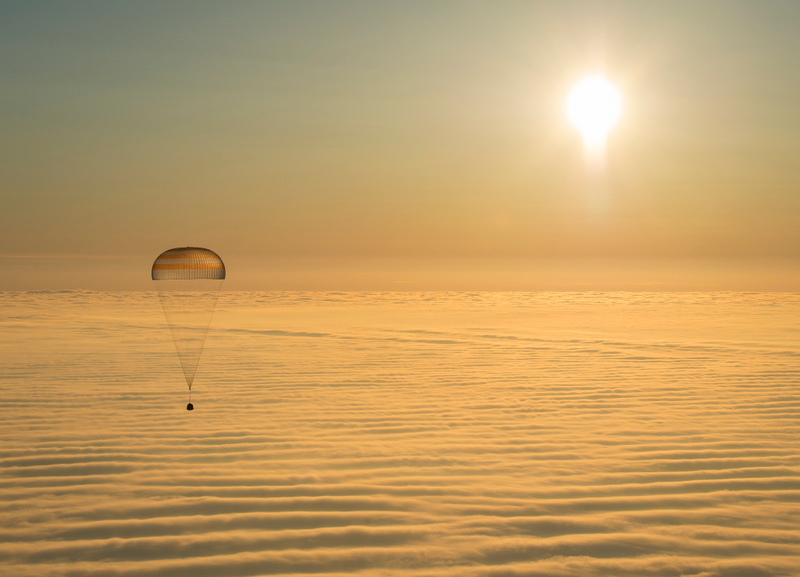 Explanation: Thursday, shortly after local sunrise over central Asia, this Soyuz spacecraft floated over a sea of golden clouds during its descent by parachute through planet Earth's dense atmosphere. On board were Expedition 42 commander Barry Wilmore of NASA and Alexander Samokutyaev and Elena Serova of the Russian Federal Space Agency (Roscosmos). Touch down was at approximately 10:07 p.m. EDT (8:07 a.m. March 12, Kazakh time) southeast of Zhezkazgan, Kazakhstan. The three were returning from low Earth orbit, after almost six months on the International Space Station as members of the Expedition 41 and Expedition 42 crews.